David Brown owns a series of old Victorian houses on Dundas St. E. He is turning them into emergency housing, at his own expense. 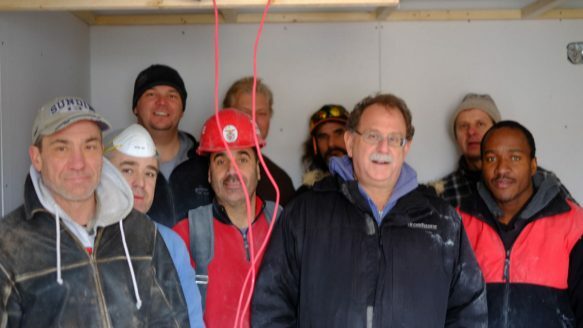 David Brown, third from the right, with his work crew. Brown owns a series of old Victorians on Dundas St. near Sherbourne Ave. and is converting them to provide supportive short-term residence for young native people. There has been a lot of talk about homelessness as a result of the recent deaths of two men on the street; much of the talk has been about shelter capacity, cold alerts, the usefulness of the various policies, and the shortcomings of the shelter system; some of the talk has even been about the need for housing. David Brown is one of the few who is actually doing something. He owns a series of old Victorians on Dundas near Sherbourne. He has, at his own expense, developed the first of these houses as a supportive short-term residence for young native people. When we met some months ago, he had just gutted the remaining row houses and he was in the early stages of restoration. So I called him up to see what was new. The house where he was working the other day will have 19 single rooms and will be managed by the Fred Victor Centre; it will be staffed around the clock; the staff includes a cook. The rooms will be used as emergency shelter housing for women until they can find permanent housing. Each room will have a private bath and a bar fridge. We started our tour on the third floor. We then passed a room where guy named Tony was nailing some narrow horizontal metal tracks along a stretch of drywall. I was curious. Tony said, “This is resilient sound channel. It stops sound going from one room to another.” David said, “Sound is one of the big issues.” As you might imagine where the rooms are small and many. Tony said, “I put the drywall, then the channels, and then more drywall.” David said, “The building department isn’t used to this. I had to get a supervisor to come and take a look. We built one room according to code, and another one this way.” How did he demonstrate the silence? He proved his point, but here’s the thing: He doesn‘t have to go the extra mile. It would be cheaper if he simply built the rooms to code. The women who will be staying here might not necessarily complain about the noise, nor might they feel that they are in any position to complain. Building it right is the right thing to do. I speak as a guy who lives next door to an opera singer who practices at home; nessum dorma, my eye. David said, “The code also calls for walls with a one-hour fire separation; these are rated two hours.” And the water pipes he installed are copper, and there are heat-recirculating ventilators, and where there are plastic pipes there are stop collars to prevent any fire from traveling. And the rooms all have good windows and therefore a lot of light, and light is good, but here’s a serious consideration — David is looking at ways to prevent people on the upper floors from, um, leaving by those windows or, on the bottom floor, to prevent people from entering. If he’s right, then this house and the one next door to it will help some 150 women a year to get off the street. And so he is doing what no level of government has the wit, the courage or the heart to do. He is a madman, or a saint.